Text in Devanāgarī and translation by Mohini Mohun Chatterji (1858 - 1936). 228 Pages | First edition 1932, 2nd to 5th reprints 1947 - 1983, 6th reprint 1995, 7th reprint 1999 | Hardcover | The Theosophical Publishing House, Adyar | ISBN: 8170592526. The English translation appeared for the first time in Vols. VII (1885 - 18886 and IX (1887 - 1888) of The Theosophist. Vivekachudamani literally means 'crest jewel of wisdom'. It is an important work of Śrī Samkarācārya, one of the greatest sages of Ancient India. Endowed with lofty and sharp intellect, he wrote many incisive commentaries on great standard works of Hindu philosophy. But they are beyond the reach of those, who have not attained a high proficiency in Sanskrit and other collateral philosophical disciplines. 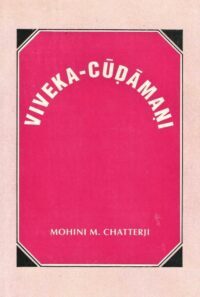 Here in Vivekachudamani he distils the quintessence of what he taught, that is, the non-dual or Vedanta or Advaita Vedanta in easy Sanskrit verses, whose sublimity of content is matched only by their lyrical beauty. Each verse is presented here with a free-running English translation.